When I was growing up, littering was such a problem that there were entire public services TV campaigns to stop it. One that I remember was called “Tennessee Trash” and featured a singularly unattractive man in a wife-beater t-shirt tossing beer bottles and detritus out of his dented convertible. I can tell you it made an impression. You certainly didn’t want to date him. And who could forget the award-winning PSA with the tearful native American? It was a brilliant device to make us parvenus feel like rude house guests. Having largely tackled that problem, we’ve moved on to Reuse, Renew, and Recycle. 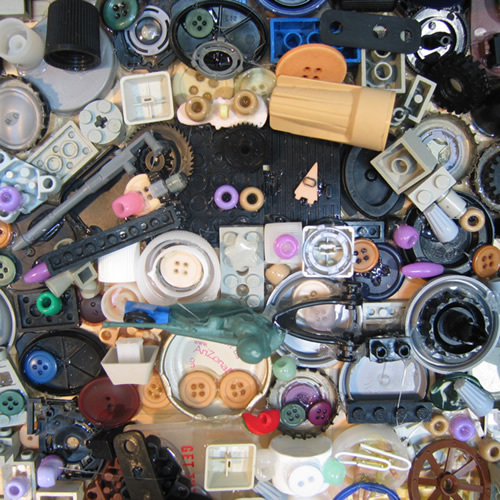 Sorting and separating is de rigueur. 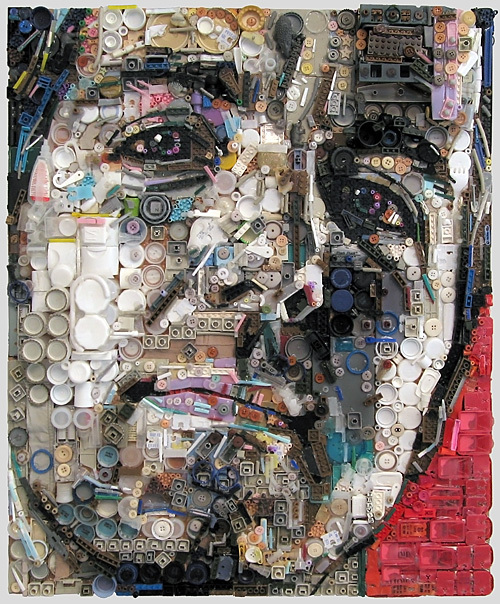 Artist Zac Freeman creates wondorous pieces from film cans, bottle tops, buttons, and the like. Clean and green. Good work. Strikes me like Howard Finster meets Chuck Close, which is good, especially the Finster part for me. sort of a cross between Chuck Close and Vik Muniz. If you haven’t seen the documentary “Wasteland” on Muniz’z recent project, it’s truly amazing. Not quite clean and green. Look at the gas mask that he’s wearing while creating these amazing works. This is seriously amazing! I think the first one is my favorite. The colors are captivating.